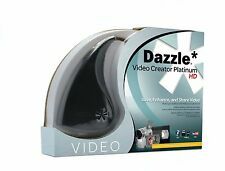 Pinnacle Dazzle Video Creator Platinum HD 15. 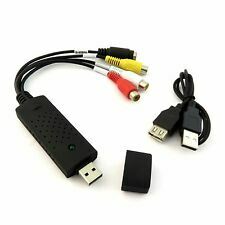 Dazzle USB Box connects easily to a VCR, DVD player, Xbox, camcorder or almost any other video device. Pinnacle Studio 15 HD video editing software -- Make and share great HD movies easily. 2 Farbgeneratoren. - Tally: Rotes Licht für Programm- und grünes Licht für Vorschauanzeige. - 1 DVE mit 3D-Umrandungen und Schattenwurf. - 8 routingfähige und 2 feste für Programm und Vorschau. MEDION TV-Tuner 7134 PCMCIA DVB-T/TV/FM/Video mit Zub. • 128MB Arbeitsspeicher oder besser. Hohes Band 442.00 to 863.25 MHz. Kein Problem! Multi-Hibryd DVB-T / Analog TV / FM / Video Notebookkarte. Soundausgabe: intern über Soundkarte. Kalkulieren Sie diese Laufzeiten mit ein. OVP! VERSANDFERTIG - AUF LAGER! HÄNDLER! Shinobi - der neue 5" 4Kp30 HDR Field Monitor von Atomos. Shinobi 5" Monitor Unit, AC Adaptor w. dummy battery, Quickstart guide. 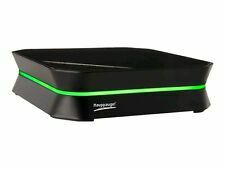 hauppauge hd pvr 2 gaming edition. Condition is New. Dispatched with Royal Mail 2nd Class. The box is a quite scruffy, it was bought from Maplins in this condition, but we've never used this item. It is complete apart from the quick installation guide. It was unboxed at some point when it was decided this system wouldn't work for us due to us not having room to set up everything needed in one place! From a smoke and pet free home. If you have any questions I will answer asap. Thanks for looking! Der UltraStudio Mini Recorder ist der Mini-Recorder im Taschenformat. UltraStudio Mini Recorder, Software-CD. der bei seiner winzigen Größe ausschließlich SDI- und HDMI-Anschlüsse plus Thunderbolt bietet. Atomos definiert die Kategorie All-In-One Monitore neu. 1x Atomos Shogun Inferno. AtomHDR kann 10 Blendenstufen an Dynamikumfang verarbeiten und ist ideal für 10-Bit Log-Material geeignet. Der neueShogun Inferno von. Höchste Signalqaulität durch canopus DV codec. Der canopus Hardwarecodec wurde in Kooperation mit NEC entwickelt. über den 6-poligen Firewireanschluss wird das Gerät auch mit Strom versorgt. Sollten Sie ein Notebook oder PC mit nur einem 4-poligen Firewirekabel bzw. DVB-T2/T2 Lite/T. TBS 6281 DVB-T2/T Dual Tuner Card can be used as a digital video recorder for recording digital terrestrial TV programs with full HDTV support. High sensitivity DVB-T2 dual tuner for the best digital TV reception. Numériseur Vidéo. Quelques conseils pratiques . Das Ninja Display hat einen Dynamikumfang von 10 Blendenstufen direkt vom Log/PQ/HLG-Material. Du zockst gerne?. Zeichne Deine Erfolge in 4kp60 oder HDp240 direkt von der Spielekonsole über HDMI auf. BA33-H Expansion Card. We have a limited quantity for sale at a reduced price. Great Prices. Why Choose us?. Light Fittings. Support multi streaming software, allowing life video streaming, webcasting and video conference. Great for live streaming, video conferences, or distant teaching. Laptop Power Jack Board. Ezcap261 HDMI Video Capture Card. Will show wear and tear. We did our best to fully test this and found no issues. Item is new. Pictures shown are of the item for sale. Elgato EyeTV 250 Plus Digital/Analog TV Receiver Video Converter MAC Apple Media. Condition is New. For Apple Mac only. Use this to cheaply transfer your old VHS recordings to PC and burn to DVD. 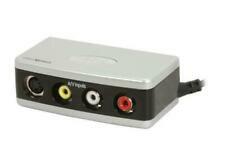 1 x Video Capture Device (female phono). It includes the driver and software to record the source onto your computer/laptop giving you the power to do what you will with it. It beautifully integrates a digital audio mixer, video switcher, multi-viewer touch screen and USB video/audio streaming interface into a stand-alone device. VR-4HD SYSTEM PROGRAM VER.1.5. The Ver.1.5 update supports capturing a still image, sending a still image from the VR-4HD RCS on PC/Mac, and PinP 1/3 size in addition to 1/2 and 1/4 sizes. This TV/FM tuner card has an universal TV tuner built in to decode both analog basic cable channels or UHF/VHF closed-circuit channels for all countries in the world. This PCIe TV video capture card is featured with RF coax input, composite RCA video input, 3.5mm audio input/output and a FM antenna input. 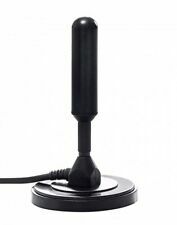 Modell: MD95700 USB TV Tuner Box. Antennenanschluss Für den TV-Empfang. Antennenanschluss Für den Radio-Empfang. Fernbedienung, Handbuch und Netzteil. Sie sind zur Rückgabe gebrauchter Batterien als Endnutzer gesetzlich verpflichtet. 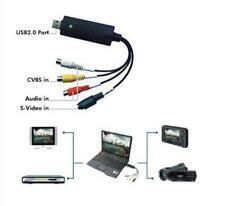 August VGB100 - External USB Video Capture Card. Transfer videos from VHS and camcorders straight to your PC hard drive. The August VGB100 video capture card is the simple solution for digitising your old videos. 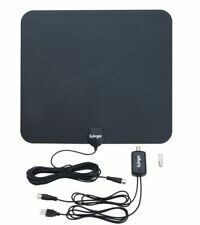 That's up to 50 digital TV channels and 24 radio stations forFREE and with no subscription. 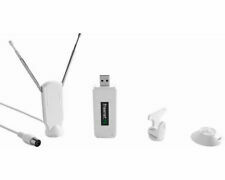 1 x Mini Digital DVB-T USB Dongle. It instantly transforms your PC into a Digital/Personal Video Recorder, allowing you to schedule recordings, pause rewind and replay TV shows. Use this complete kit to cheaply transfer your old VHS recordings to PC and burn to DVD. It includes the driver and software to record the source onto your computer/laptop giving you the power to do what you will with it. Zwischenverkauf vorbehalten! Preisvorschläge und Käufe sind uneingeschränktmöglich. Preisvorschläge und Käufe sind uneingeschränkt möglich. Alles funktioniert 100 % mit Case. Videoanschluss HDMI-Typ A, SDI-Video. Produkttyp Audio/Video-Mixer. Gewicht 1,05 kg. USB2.0 Video Adapter with Audio, it can capture High quality video and audio file direct by USB2.0 interface without sound card. Solution for laptop, we have enclosed the professional video editing software Ulead Video Studio 8.0 SE DVD then provide best editing function for you.